Did you know that January is National Bath Safety Month? I take my job as bathroom safety monitor very seriously and try hard to never let Mommy go potty alone (unless I'm busy napping, of course). Simple things like always using non-slip bath mats to avoid nasty falls are very important. I'm so thankful us kitties use our tongues to bathe...I'll never understand how humans can sit in a tub full of water wearing nothing but their birthday suits! It's downright indecent. Do your kitties enjoy keeping you company in the bathroom? Funny enough, none of us kitties really feel the need to follow my human into the bathroom - I guess we figure she'll be okay on her own! However, SHE follows US to the litter box and watches us. I think it is a little creepy, even if she says she is only doing it to keep track of our "output" and health. Crockett likes to watch people take baffs. And use da "facilities" - MOL! We thought it was our duty to be in the bathroom whenever any human is in there! My cat likes to get into my pants when I'm in the bathroom. I am usually still wearing them. Mudpie, it's so sweet that you keep your mommy safe in the bathroom. My cats don't follow me into the bathroom too often. They're usually asleep! I have one that likes the bathroom when I use it. He mostly wants the water faucet turned on. They only follow Mom around when it is meal time, otherwise, they never do. The kitties here are dedicated bathroom monitors, too! Evan is the full-time bathroom chaperone, Eddy is the sporadic checker, and Thimble is the one who comes in and stares at herself in the vanity mirror the whole time (not that I blame her royal cuteness for doing just that). I don't know what us humans would do without all that professional bathroom help! Oh yes, our kitties are great bathroom safety monitors as well. We only follow Mum round when it's time for our lunch, tea, breakfast, snack or a cuddle. Well, we Sphynx get bathed regularly in the tub, so we don't think it's indecent! We do like to accompany our humans when they use the bathroom, though. Oh yes, Gus loves to hang out near the sink and wait for me to wash my hands. Then he rubs against my arms. Although last night he just hit the light switch as soon as I sat down. "Thanks Gus"
I love that "her royal cuteness"
Caster and Sampson are the bathroom monitors around here! Sampson is our designated "potty kitty," and Caster is the "shower kitty." They take their jobs very seriously, as it seems you do too, Mudpie. Always has to be a kitty in the bathrroom.. cause the mom might drown in the bathtub or fall in the toilet. We does goods bathroom patrol. Ever since she fell in, Amarula no longer keeps me company at bath time! How adorable you are! Fergus has recently become enamored with the bathtub, just as you seem to be. But he only really hops in there when the water is safely turned off. I think he likes to watch the droplets roll down the walls in the aftermath of a shower. Sometimes. I never actually look at her nekkid body or I’d prolly go blind. I lay on the clothes she’s just removed. Our kitty cats can't follow us to the bathroom. The dogs are always waiting for us outside the door. There's no room! MOL!! 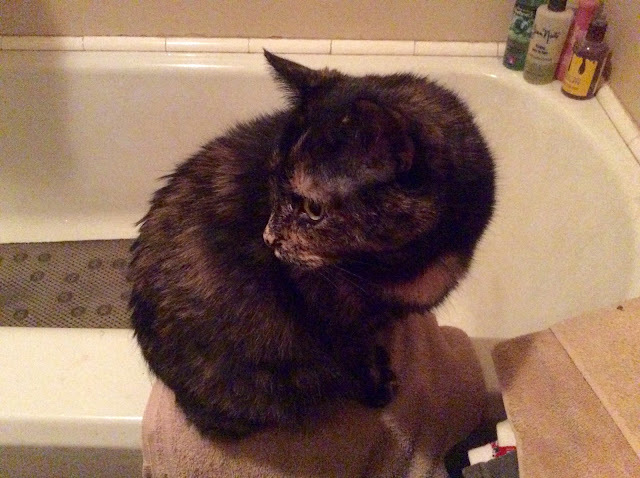 It is really pawsome of you to make sure your mom will be safe in the tub, Mudpie. My kitties like to make sure that I'm okay while I'm showering too. They will sit just outside of the tub and meow at me (or in Dexter's case, tap the curtain). TBT allus closes the door on us while in there. This is all too familiar, it's impossible to go to the bathroom alone in our house. Rufus the Red and Mickey Mouser always come into the bathroom first thing in the morning to help me brush my teeth. And to make sure I know it's time for breakfast.